Historical evidence suggests an increase in UFO activity near the beginning and during times of war and conflict. Some cases also involve sightings of unidentified partial submerged objects, or USO phenomena. Reports of unidentified flying objects consistently date back throughout the ages and are not a new age mystery. Past civilizations described the unexplained flying objects in terms relating to their current knowledge and interpretation of the events, of the specific reported time period. One prominent case involves several hundred sightings written throughout ancient city gazettes during the time of the Black Plague epidemic. Many cases of cigar shaped flying vessels were reported, along with a mist filling the air, to the point that people believed they could see the plague coming toward them. 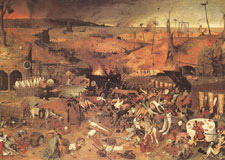 The mass sighting during the epidemic is very similar to news reports in 1561 and 1566 in the Nuremberg area, involving similar shaped objects. Another such incident refers to a single flying object reported over several countries spanning from Scotland all the way to eastern China, detailed from individual sighting reports in those respective countries. The intriguing mystery of the reports is that they all happened within the same time span between countries at war with each other and relied on courier communication of letters estimated to take far longer than any of the documented accounts. Events in the 20th century such as the Black Forest in 1936 and Roswell in 1947 acted like a rooster call to those who weren't previously aware, bringing significant attention to the possibilities of UFOs existing around the world. Both cases are filled with controversy and seem to lack the empirical evidence necessary to satisfy skeptics. Virtually no evidence has been reported or found regarding the Black Forest incident, yet the crash was documented to have happened. Beliefs are that Germans soldiers retrieved wreckage for reverse engineering in creating newer technologies. This does coincide with numerous reports involving balls of light, or FOO, over European skies in 1944 believed to be a German secret project. The theory also references how much more advanced German technology was at the time in comparison to the other countries in the world. 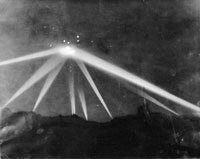 It may also explain the culprit of the 1942 Battle of Los Angeles, when an unidentified flying craft triggered over 1,400 shells to be fired in an hour time period. 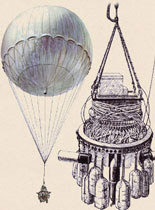 The Roswell incident was attributed to a weather balloon by Major Curtan according to a telegraph sent to the FBI. Many still believe that between the type of debris found at the wreckage site, reports before the crash, and inconsistencies in the military reporting procedures, that it was actually a government UFO cover-up. Eye witness claims, a supposed alien autopsy and new photo analysis of documented evidence continue to fuel speculations of what really happened on that warm summer day. Some sightings during the 1940's might also be explained by Fu-Go devices, or the Japanese balloon attack. Around 1,000 balloons with an integrated payload and trigger are estimated to have reached the United States and Canada by taking advantage of the global jet stream air path. The Japanese claimed to have launched more than 9,000 in total with the first series in 1944 from Honshu Japan, during the same time of FOO reports over Germany. The problem with this solution, however, is the mysterious glowing orbs over Germany could be flown through with an airplane. Only one known case with cause of death to a Fu-Go device was documented in Oregon to happen in 1945. According to further accounts, it is known the British were also experimenting with crude balloon-type devices during 1942-1944 possibly contributing to the unidentified sighting phenomenon at the time. Outside of the busy skies of the 1940's, cases of mysterious unexplained flying object related incidents and sightings have risen substantially over the years to the point that a designated organization was established in 1969. Currently, the Midwest UFO Network, MUFON tracks and stores reports of sightings across the world and is accessible to the general public. Their mission is one of analytical and scientific study of alien craft phenomenon for the benefit of humanity. They're working to catalog, organize, and decipher report information makes the most logical sense in determining the reasons for a strange phenomenon reoccurring throughout human history. Although unidentified objects in the skies above Earth are often associated with aliens and extraterrestrials by sensationalized media spinning, it does not necessarily mean they are the probable cause. Only solid research and conclusive evidence can help us determine exactly what these strange UFO's really are.